About a year ago I embarked on what has been an absolutely fabulous journey into computer-based digital audio, culminating in what can only be described as a transformation of my main audio system. Along the way I have received quite an education. That education included learning a bit about setting up your own server, listening to some of the most sought-after DACs on today’s market and understanding the benefits of battery-powered digital. I’m not going to regurgitate all of that in this article, as that would take way too long. Rather, I’m going to talk about an acoustically fabulous set of products that have been central to my education. They are from a small, relatively unknown company – Empirical Audio. It is accurate to say that my journey began when I decided to review and then purchase the Qsonix Q105 Music Server (updated review in March 2010 of Dagogo). With its wide array of search features and ability to provide instant access to anything in my music library, the Qsonix interface changed my listening experience. However, like any true audiophile, I wanted state-of-the-art performance to go with the state-of-the-art interface, so I used the digital output of the Qsonix into my Esoteric DAC. However, in doing so I lost the ability to slave to a single clock, thus was in an irritating predicament of losing that last degree of resolution. As I started my search for a solution, I called Mike Weaver at Qsonix and asked him whether he knew of any steps I could take that could really ratchet up my performance. He directed me to a customer who had some mods performed by Steve Nugent at Empirical Audio. After contacting this customer and learning of his experience I called Steve Nugent and got the lowdown. His mod would slave the Qsonix to a custom external master clock. That clock was the Empirical Audio Pace Car. With some trepidation, as the mod voided the Qsonix warranty, I took the leap. I sent Steve my Qsonix to modify and purchased a customized version of his Pace Car. I don’t want to jump too far ahead and kill the suspense, but I was so happy with the results that I began paying more attention at Empirical’s other products. Right about that time Steve/Empirical released a battery power option for the Pace Car. Given my prior positive experience I placed an order for the battery. Adding the battery raised the system’s performance further, and I decided I needed to hear more of Empirical’s products. I started pestering Steve for a chance to review his Overdrive DAC. He was very busy with filling orders, but I persisted, and he agreed to send an Overdrive for review after the 2010 Rocky Mountain Audio Fest. In preparation, I started seeking auditions of several other DACs: the Berkeley Audio Alpha DAC; the Weiss DAC 202; the Lessloss DAC 2004; and the dCS Debussy DAC. At the same time I also received a complete set of MIT cables for review, including the very excellent Oracle Digital MA-X (see November 2010 Dagogo). This was going to be fun! Here I want to briefly discuss three things: (1) Differences between the top digital components; (2) optical drives vs. hard drives; and (3) yes – the dreaded issue of digital vs. vinyl. My purpose is for you to understand my preferences/prejudices. Don’t worry, I’ll keep it short. I should first mention that I’ve become jaded by repeated claims of “breakthroughs” and “massive improvements” in sound that have become all too common in audio. This applies to all components. Granted, I’ve heard a few systems that I’ve liked more than my own main system, but the biggest differences have most often been in the voicing, while improvements to extension, resolution, dynamics and soundstaging have been pretty slim. Moreover, these often modest improvements usually come at a very hefty increase in cost. My own 2-channel system’s retail value – please excuse what may to some seem like bragging and/or ridiculous indulgence, but I’m doing it to make a point – is right around $120,000. To make a really significant difference, I probably need to spend at least another $35,000. In my opinion, this phenomenon is especially true with digital front ends. There are several digital front ends that flirt with $100,000 price tags. There are several more in the $25,000 to $75,000 range. Make no mistake about it – these components are really good. However, there are also several digital front ends in the $5,000 to $8,000 range which sound very close to those stratospherically-priced components. In most cases, well-implemented systems with these $5,000-8,000 digital components outperform badly-implemented systems with the $75,000 components. The point is that you can get digital performance that approaches the state-of-the-art at a relatively “affordable” but not cheap price, and in some cases the differences are very hard to identify. Second – and despite my having tried very hard this past year – I haven’t found a single optical disc reader that sounds any better than a properly-implemented hard drive. I’m not saying that I’ve heard everything. Not by a long shot. But I’ve heard enough top units that I can say with some confidence that there is no reason to plan future systems around optical drives. Sorry. Finally, for the record, let me say that I love vinyl. I’ve heard fabulous vinyl-based systems of fellow audiophiles and wished I had enough money to have both a high-end vinyl front end and a digital front end, because, frankly, I’ve also heard some really lousy vinyl. Moreover, I listen to a lot more rock and pop than classical and jazz, and I like to try and keep reasonably current, choosing not to bury myself only in the latest expensive reissue of 20-year old vinyl recordings. So it’s a no-brainer for me to choose top-end digital recordings from the standpoint of availability and cost. But even more importantly, I think a lot of high end digital sounds better than vinyl. So don’t think for a moment that any of the digital front ends discussed are not up to vinyl. Quite the contrary, especially with today’s growing library of 24/96 and 24/192 music files. The Pace-Car is a 24/192 reclocker. It goes between your source device and your DAC, buffers the music data stream in a memory and then reclocks it out. The Pace Car is available in several variations, which determines the final price. The Pace Car comes standard with two clocks, one for 44.1/88.2/176.4 and a second for 96/192. Either or both of these “standard” clocks can be upgraded to a Superclock4 or an Ultraclock. I ordered my Pace Car with two Ultraclocks. The Pace-Car comes in a small black enclosure. It has inputs for USB, SPDIF, toslink, and an Empirical Audio proprietary I2S connection for outputs. AES/EBU is an output option. According to Empirical, I2S is a more direct D/A interface than S/PDIF. A typical I2S is a three or four-signal interface that includes clocks. Since this is the native interface for most D/A chips, driving I2S directly (without S/PDIF translation) provides the opportunity to reduce jitter. Empirical Audio’s standard I2S interface uses 4 signals and 4 returns and a RJ-45 connector. It is compatible with I2S on DACs of several makes, including those from Stello, Perpetual Technologies and Northstar, as well as Empirical’s own Overdrive DAC. Mode 1: Synchronous word-clock. The source device must have a word-clock input (examples include several Esoteric components). A word-clock cable is connected between the Pace-Car USB and the source device. You will also need two digital cables, one of which can be run-of –the-mill. Mode 2: Synchronous master-clock. The source device must have a slave-clock input to use this mode. Most devices using this mode will require a modification to incorporate a slave-clock input. A master/slave-clock cable is connected between the Pace-Car USB and the source device. Mode 3: Asynchronous. The Pace-Car USB is tuned to the source computer or device and tracks the rate of the incoming digital stream. The customer must ship the source device to Empirical Audio so that they can tune the Pace-Car USB. No modifications are made to your source. There is an additional cost for tuning and only Superclock4 can be used. With a tuned Superclock, the Pace-Car USB can still be used in Mode 1 or 2. A Toslink cable is included. Mode 4: USB. The USB interface is galvanically isolated, both power and ground. This isolation eliminates the ground-loop between the computer and the audio system, even when using the I2S output. The particular mode in which I operate the Pace-Car is Mode 2, with my modded Qsonix. In this mode two master clock cables run from the Master Clock A and Master Clock B outputs of the Pace-Car into the Qsonix, and one low-cost S/PDIF cable runs from the Qsonix digital output to the Pace-Car; then one high-quality S/PDIF cable runs from the Pace-Car to the DAC. Steve Nugent indicated that the quality of this last cable is important and should be of highest quality. However, the other cables can be relatively inexpensive. I should note that if you use the USB input that you can save significant dollars on an SPDIF cable because any USB connection will still produce high quality sound. The Pace Car in USB automatically switches all sample-rates when the new track is played, so you just connect it and then forget it. The Pace-Car is not powered via a regular AC power cord, but by a 12-volt DC adapter. This powers everything except the USB interface, which is powered via the USB cable. How Did The Pace-Car Sound? I knew when I made the decision to rebuild my front end around a music server that I would initially lose something by virtue of not being able to slave the music server and DAC the way I had been slaving my Esoteric P-70/D-70 combo. Adding the Pace-Car reclocker immediately restored the detail and dimensionality of my previous reference Esoteric combo. In fact, I’m tempted to say that it surpassed my Esoteric combo’s original performance, but I was not able to compare head-to-head. That’s because I sold the transport. The Pace-Car clearly increased resolution in a natural way throughout the frequency spectrum, and performer placement and dimensionality improved. In effect, I added the incredible functionality of the Qsonix interface, gained the ability to play 24 bit files, and even when playing 16-bit files the performance equaled or exceeded that of my previous reference transport. I did all of this for the price I had paid for that transport four years ago. Keep in mind that I also sold my reference transport, thus translating my actual out-of pocket expense into way less than that cost. Sweet. Despite my very positive experience with the Pace-Car, I’m a cautious guy when it comes to spending audio money, so it took me a while to get around to ordering the Monolith battery supply from Empirical. One thing that persuaded me to take the plunge was the very positive experience I was having with the battery-powered LessLoss DAC 2004. There was a certain liquidity that the battery seemed to infuse into the DAC’s performance. In any event, I was glad I took the additional plunge. The Empirical Audio Monolith, just like the Pace-Car, is powered via a 12-volt DC adapter. One of the disadvantages of battery supplies is that they run down and take time to recharge. This is quite irritating if the battery runs down in the middle of a listening session. The Monolith is set up so that when the battery runs out, the unit simply switches to pass-though mode and continues operating. Moreover, for whatever reason, perhaps the very use of a DC adaptor to power the unit, the sound remains quite good. The nature of the improvement that the Monolith brings to the Pace-Car is readily apparent as soon as the Monolith is installed. For our readers who have experience with good battery-powered components will immediately understand when I say that everything sounded more natural. Those of you who haven’t heard battery-powered systems will need to imagine everything sounding smoother, but without any loss of definition. Cymbals that before sounded a bit like white noise instead simply shimmer. A saxophone that previously sounded like a well-recorded sax now felt like a real saxophone was playing in the room. The previously well-defined upright bass now graduated to a bass where the natural attack and decay of that instrument became more evident. Natural. It’s interesting to note that all of this improvement came solely from running the clock on a battery. It demonstrates that changing the power supply on individual key aspects of the digital chain can render very significant improvements to the system’s audio performance. I should also point out that after I added the Monolith and counted all my costs, I had obtained a wide range of improvements in audio performance and functionality for the same amount of money that I spent on my reference transport four years ago. Finally, the Monolith can also be used with other Empirical Audio components, and I’ll be getting to that as we move into the next stage: the Overdrive DAC. 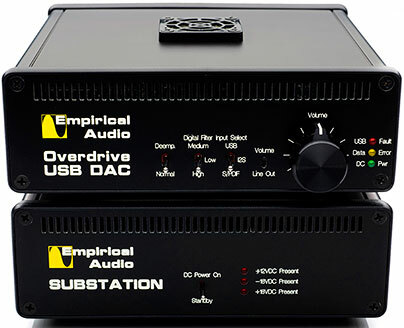 The Empirical Audio Overdrive USB DAC is a very unassuming-looking non-upsampling DAC. In fact, the “USB DAC” portion of the title is a bit misleading. Yes, it’s a very, very good USB DAC, but it is also a very, very good DAC, by any measure. There are a couple of things that immediately distinguished the Overdrive right out of the box. Let’s look at these separately. Out of the box, the most obvious distinguishing feature is that the Overdrive is in its own small chassis and only has a single high-current DC input connector. There is a second chassis labeled the “Substation.” Three, yes, three DC adapters feed the Substation – a positive 12-volt, a negative 18-volt and a positive 18-volt. Steve Nugent says that ideally all three would be plugged into the same outlet. However, if this is not possible the 12-volt analog supply should be plugged directly into an AC outlet and the other two supplies into an AC strip. As the Overdrive power supplies are all DC supplies, an AC power cord is not necessary. This can save you a lot of money you might otherwise spend on an audiophile power cord. More on the use of aftermarket power cords later. The second most noticeable feature out of the box is the inclusion of an I2S input in addition to the USB and S/PDIF inputs. Inclusion of the I2S input on the Overdrive allows it to be driven from the I2S output on the Pace-Car 2 reclocker. Steve Nugent explained that the I2S interface allows the master clock to be closer to the D/A chip inside the Overdrive DAC, reducing clock jitter. Based on my results, I won’t argue with him. The I2S cable Steve sent me to use was a lot less expensive that my reference SPDIF digital cables, and this presents another way in which a user can save money otherwise spent on high-end cables. The third feature to notice after removing the Overdrive from the box is the selectable digital filter, as well as a “de-emphasis” switch that provides equalization for recordings with high frequency pre-emphasis. Although I preferred the standard filter setting which is how the Overdrive arrived, the filter switch provides some flexibility to tailor the sound. I did not have any need to try the de-emphasis switch. Finally, the fourth feature that becomes evident after reading the manual is that this DAC begs to bypass the preamp. I don’t merely mean that you can control the volume through the Overdrive. There are plenty of DACs with poor volume controls. I mean that once you test the Overdrive running directly into your amp you will look for ways to avoid a preamp. The way you do this is unconventional and won’t work in all applications, but is ingenious and works extremely well with the USB connection and also with the other connections if you have a source that incorporates digital attenuation. I’ll explain in detail later, but if your only source is a server, you can eliminate your preamp with the Overdrive. Other less-obvious features include the fact that the Overdrive USB interface is the same one used in Empirical Audio’s own Off-Ramp USB converter, which many believe is among the best USB converters you can buy. The Overdrive also has a fully balanced analog path with both RCA and XLR outputs, which can be used simultaneously, a two-position GAIN switch, and internal range jumpers that allow you to set the range of the quietest setting. Windows-based laptop as the source directly to the Overdrive powered by the Monolith battery supply via USB cable. I also experimented with various power cords to test whether you can indeed eliminate the need for high end aftermarket power cables by plugging the three wall wart DC supplies directly into the wall. During this time I periodically took out the Overdrive and substituted other highly regarded DACs: the Berkeley Audio Alpha DAC, the Weiss 202 (but not in firewire mode), the Lessloss DAC 2004 and the dCS Debussy. Though this was definitely not a “shootout” as I did not assemble a panel of listeners, did not implement exact volume matching and did not always use the same music, I will provide my impressions below. My notes from my listening sessions comparing the different Overdrive configurations are so extensive that I need to reduce things down to some basics, or this will be a thirty-page article. The Overdrive’s sound on its own is very extended, crystalline, transparent and highly resolving, but in a natural way. Steve Nugent wasn’t sure what kind of hi-res library I have, so he included a demo disc of a variety of music for me to download. It included 16 bit/44.1kHz files, as well as 24/96 and 24/192 files. Among those files was a 24/96 file of Keith Don’t Go performed live by Nils Lofgren. The nuances of Lofgren’s guitar were presented as well as I’ve ever heard them before, and that included hearing this track on a few $300,000+ systems featuring incredibly expensive digital front ends. But it wasn’t just that; there was more detail. In this case, the addition of detail added life to the recording. All too often, added detail seems to make the recording sound more clinical. That was not the case with the Overdrive. This was further confirmed by another track supplied by Steve, Kodaly’s “Sonata Op. 8, Movement 3: Allegro molto vivace”, which was a 24/192 file. Fine details were revealed in the very nuanced performance, but they always supported and never detracted from the whole. Finally, a plain old 16/44.1 file of a live Larry Carlton performing The Pump sounded holistic, with great body and weight, yet provided great details of each of the performers. Another example of these traits was found on my own copy of Haydn’s “String Quartet in D, Op. 76, No.5- Finale – Presto”, from 2L The Nordic Sound. This is a fast and intricate piece that allows you to listen to the overall performance, focus on individual performers, or switch back and forth throughout the piece. Consequently, you can listen multiple times and get a different read on the piece each time. The Overdrive operating on its own without the Pace-Car or the Monolith facilitated this better than 95% of the DACs I’ve heard. The furthest treble extensions of the violins could be clearly discerned without a hint of grit or grain, while the weight and attack of the cellos were top notch. All of this proved to be true both by using the USB input from a crude laptop server I fashioned, as well as via SPDIF cable from my Qsonix digital output. In my case, adding the Pace-Car reclocker in the SPDIF chain sounded better than the USB straight into the Overdrive, but the direct USB connection was by far the best I’ve heard, which is consistent with the reviews of Empirical’s Off-Ramp USB converter. Not only was it the best USB DAC I’ve heard, it was better than the vast majority of DACs I’ve heard of any type. In all cases the Overdrive showed no weaknesses, having great extension, resolution, body, speed and coherence. When a particular configuration sounded better to me, it was simply more of a good thing, not a filling-in of anything that was missing. I want to underscore the last point of the preceding paragraph. There are some components about which people say things like: “the treble is great, but it’s a bit weak in the bass” or “incredible midrange, but not the most extended” or “great extension, but the treble is a bit brittle,” etc. None of that applies to the basic Overdrive – it has no weaknesses, only strengths. That is the basic requirement for a component to be exceptional. Now, let’s add some more parts. After going directly into the Overdrive from the Qsonix, I listened to the same music, but now adding the Pace-Car to the equipment chain, and then adding the Monolith to either the Overdrive or the Pace-Car. Adding the Pace-Car with Ultraclocks ticks the Overdrive’s performance up another notch, making what already seemed to be smooth stratospheric highs smoother and more detailed, and full-bodied yet nimble bass deeper and more precise. Adding Monolith battery power then pushes the Overdrive’s sound into elite component territory. I went from thinking I had really great sound to experiencing the you-are-there of the actual performance. I did not have two Monoliths, so I could not run both the Overdrive and the Pace-Car on battery power, but I have no reason to doubt that I would have gotten even further improvement. Now, when you look at the pricing of all these components together you’re no longer looking at a modestly-priced unit. However, you will have a combination which easily rivals the best there is. Moreover, you don’t have to spend all of your money at once. You can start with the Overdrive on its own which, as you will read below, I preferred to virtually all of DACs I’ve heard, and then add a Monolith battery supply, later add a Pace-Car with Ultraclocks, and then add another Monolith for the Pace-Car. Depending on your existing setup, you might instead choose to start with the Pace-Car, then add a Monolith battery supply to the Pace-Car, then add the Overdrive, etc., etc. You get the picture. One of the more interesting comparisons involved substituting an I2S cable connection for the SPDIF cable connection between the Pace-Car and the Overdrive. My comparison cable was the very high-end and expensive MIT Oracle MA-X digital SPDIF. When I substituted the $370 Revelation Audio I2S cable my initial reaction was that I had lost some detail and extension. Then I remembered that each circuit needs its own break-in, and I had not run the I2S connection at all, while I had been running the SPDIF connection 24 hours a day for nearly 2 weeks. I left the I2S plugged in and playing music for 2 days, then unplugged it, substituted the Oracle SPDIF cable, listened for an hour, then again inserted the I2S cable connection and listened to the same music. The I2S connection sounded different from the SPDIF, but not because of any loss of fidelity, slam, soundstaging, etc., but by way of what seemed like a different voicing of the music. The presentation actually improved the bass reproduction, which had been excellent. It also produced a slightly darker sound, much like the difference between listening to Transparent’s top end cables versus Nordost’s top end cables. I eventually determined that I preferred this proprietary Empirical Audio I2S connection to the SPDIF, despite the cost differential. Amazing. Finally, after playing with different inputs, I turned my attention to the Overdrive’s volume control. I decided to see what would happen if I bypassed my preamp. You should know that I lived without a preamp for several years and eventually saved up enough money to buy the top-of-the-line MBL so I could have both slam and tonal performance. To save the suspense: The Overdrive has shown me that it is really possible to have elite performance without a preamp. Not only did I not lose a thing when I took out the MBL, but I would say that the performance of my system actually improved! I would very strongly recommend trying the Overdrive directly into your amp if you only use digital sources. The one thing that may be a problem for some is that the volume control is manual – no remote control – thus causing you to have to get up from your seat to change volume. However, Empirical provides a clever way that you can get around this as set forth in the Overdrive manual. In a nutshell, if you are using the USB interface you can use a digital volume control, such as iTunes volume, to make small adjustments after setting the overall volume range manually at the DAC. A second way to do this that does not involve using the USB connection, which is what I do, is to have a source device which incorporates a volume control. In my case I set the general volume level manually at the beginning of each listening session, then made minor adjustments with my Qsonix screen volume control. Very nifty. Note that this approach also worked well with the Lessloss DAC 2004, which sported the high quality volume control option, but did not work well with the other DACs with volume control capability. Those other DACs’ volume controls degraded the sound. In this phase of my comparisons, I, in all cases except for one, used the Monolith to power the Pace-Car, not the Overdrive. This allowed me to judge the various DACs equally, using the same external clock. The only exception was my comparison between the Overdrive and the battery-operated Lessloss 2004. Since the Lessloss was battery-powered, I wanted to hear what a battery-operated Overdrive would sound like in direct comparison to the battery-powered Lessloss. Remember – this is not a meant to be a true “shootout.” I will not dwell on specifications. You can read each manufacturer’s website for that information. I will focus on my subjective impressions of sound quality, with only occasional comments about certain aspects of each unit’s functionality where that seems relevant. I will start with the Lessloss DAC 2004, which I have been living with for several months. This DAC was different from the others. First, it is a much older design, while all the other DACs are the most recent versions of the company’s products. I initially thought this would be a major disadvantage, but I am making educated guesses here as I believe that two things changed that. First, this was the only battery-powered DAC in the bunch other than the Overdrive. Second, it sports the PCM 1704 chip, which during my long Odyssey has consistently popped up in DACs I’ve enjoyed, even though it does not read 192kHz signals. The result of these two features is a very natural-sounding DAC whose performance is increased with Empirical’s Pace-Car reclocker. Consequently, this DAC actually was one of my two favorites along with the Overdrive, despite the fact that it was “older” technology. Its sound was the smoothest of all the DACs and never remotely came even close to sounding edgy, brittle or glassy. Its small loss of detail compared to the others was offset when the Pace-Car reclocker was added into the digital chain. As a side note, there was a very interesting effect when playing original 192kHz files or files upsampled to 192kHz on the Lessloss DAC 2004: It actually sounded better than when played at 96kHz. This made no sense to me because the PCM 1704 chip supposedly maxes out at 96kHz. Any attempt to play 192kHz files, either original or upsampled, through the dCS Debussy failed (see below) – nothing would play – but would play and sounded better than 96Hz through the Lessloss DAC 2004. The DAC 2004 must be downsampling, but why would it sound better than 96kHz? Weird. Let’s talk next about the Berkeley Audio Alpha DAC. This DAC has received rave reviews and an even greater acclaim as an audiophile value given its price. The Alpha DAC at times sounded a bit more 3-dimensional than the Overdrive, but the Overdrive’s bass sounded firmer and the upper reaches were smoother. The Alpha DAC’s depth of soundstage seemed to come at a slight expense to the body of its musical presentation, whereas it always produced realistic body in the performing instruments. There were times when these differences were easily distinguished, while at others it was difficult to tell. However, on an overall basis I value a full-bodied presentation over a three-dimensional, but ethereal, presentation. Others’ opinions may differ. Some features of the Alpha DAC could be preferred, depending upon your needs. There is no cooling fan in the Alpha DAC as there is in the Overdrive, and that as I discuss below may be important in some setups. Further, note that the Alpha DAC’s ability to invert phase will be highly appreciated by many as many discs are phase-inverted. The HDCD light may also be appreciated, letting the user know that HDCD processing is working. However, the Alpha DAC’s volume control is not up to audiophile standards, and in all cases it sounded much better through a preamp. Next up was the Weiss 202. This is clearly my most tenuous comparison. Several knowledgeable audiophiles told me that the Weiss 202 sounds best via its firewire connection. Alas, I did not have that capability at the time I had the DAC, so the reader needs to bear that in mind. Overall, the Weiss 202 was massively detailed, and at times seemed like it was even more resolving than the Overdrive. However, that resolution did not sound as natural to me as the Overdrive’s; or, for that matter, that of the Lessloss 2004. The upper frequency extremes periodically felt like they were verging on brittleness or glassiness. Mind you, I’m not at all saying that the 202 sounded brittle. Let me explain it this way. If you take a ride in the beautiful Italian countryside in a Ferarri Testarossa, you will get an exhilarating speed-demon of a ride under perfect control, but you’re not likely to remember the details of the beautiful countryside. There was just a bit of that sensation when listening to the Weis 202 in my system. Sometimes I was holding my breath in anticipation of the sound crossing over into brittleness, even though it never really got there. A perfect example was the aforementioned Haydn “String Quartet in D, Op. 76, No.5- Finale – Presto”, from 2L The Nordic Sound. Those violins were never out of line, but I kept thinking the tires were about to go off the track. It has been suggested that this would not have occurred if I had been able to implement a firewire connection. It is also quite likely that I could have eliminated this effect with other cables. However, I didn’t go through that process. Insofar as other considerations go, the 202 does not have an audible cooling fan, so you will not have that issue affecting your placement of the unit. The 202 does have a volume control, but like the Alpha DAC, it requires a preamp to hear it at its best. Finally, I teed up the dCS Debussy. I listened in three different configurations: via the SPDIF output directly from the Qsonix, via the UBS output of my home-brew laptop server, and finally via SPDIF through the Pace-Car reclocker. In all cases I preferred the Overdrive to the Debussy which was the only other DAC to have a built-in USB input. This was the case even though the Debussy had all of the audiophile qualities one could look for. My ultimate personal preference for the Overdrive was in no small part due to the Overdrive’s, in my opinion, better presentation of the body and weight of the musical presentation. The preference was very close, but in the end, decisive. In my book, this is really saying something about the Overdrive’s sound quality. Both units were supremely transparent, extended and dynamic, but I simply felt that the Overdrive was more natural and realistic. I will only highlight one “functional” aspect of the Debussy. My version did not accept 192kHz files, and would do nothing if one was played or if I attempted to upsample a lower sampling-rate file to 192kHz; unlike the Lessloss, which apparently recognizes and downsamples 192kHz files to 96kHz and then plays them. I understand that dCS now has an upgrade, which will be available soon, to remedy this. One thing I must emphasize: All of these DACs were superb performers. In some cases the differences were very minute and required extensive comparisons. In virtually all of the cases, my ultimate preferences were based predominantly on the overall ability of the DAC to suspend my reality and allow me to envision the performance and performers. This is a very tricky and system-dependent proposition. Nonetheless, as I was in fact looking for a long-term personal reference DAC my personal impressions were what mattered the most. The upshot of all this is that my independent impressions of the Overdrive DAC were confirmed when I made direct comparisons to other highly-regarded DACs. The Overdrive emerged as my preferred DAC, closely followed by the dCS Debussy, and, when the Pace-Car is included in the digital chain, the Lessloss DAC 2004. There are four downsides that I would identify on the Overdrive: the cooling fan, the difficulty of fitting three wall wart power supplies into a single wall outlet; the absence of a supplied remote control, and for some, the industrial (read: unglamorous) look of the Overdrive/Substation combo. Because of my system configuration, none of these was a problem for me, but I can see how one or more of these would be an issue for other users. The main downside for many audiophiles would be the fan used in the Overdrive. In fact, it was the only DAC with an audible fan. This didn’t affect me because my system is set up with the option of putting fan-cooled components and components with hard drives in a service closet that adjoins my main listening room. Moreover, Steve Nugent advised that upon request the fan can be biased to a much lower, quieter setting. Nonetheless, I opened the unit and adjusted the fan speed down to see how quiet it would be at its lowest setting without further biasing at Empirical. After adjustment, it could still be heard from 10 feet away during very quiet passages. This would not be acceptable for me, and I recommend that you ask Steve Nugent to adjust the fan before shipping the Overdrive to you. Again, it had no effect on my setup, but a second downside could apply to those who only have a few available wall plugs. In general, adding two more required plugs to power a device usually powered with one electrical connection may cause some inconvenience. However, because part of the Overdrive’s sound quality comes from the selected power design, this is unavoidable. The Overdrive does not come with a remote control. If you want to connect directly into your amp, which I strongly recommend you try, you will lose whatever remote volume control you had with the pre. Some audiophiles don’t use remote volume control, so they won’t care. Others like me have a source that includes volume adjustment or will not mind implementing such a volume adjustment scheme as described above. However, those with a need for remote volume control will either need to use a volume-controlled preamp or go through the process of setting up a remotely-controllable volume control for their source. As for the appearance, I can’t say that I’ve seen many DACs I’d affirmatively call “attractive.” In my mind sound quality and functionality overshadows everything else. In the group of DACs discussed, the dCS was the most attractive, the Weiss 202 being somewhat attractive, the Lessloss being OK but undistinguished, the Alpha DAC looking “industrial” and the Overdrive looking “heavy industrial”. None of this affected me since my system has never been designed to look glamorous, especially in light of the fact that significant parts of my front end are hidden away in a separate closet. I have omitted a lot of details about the Overdrive’s setup and functionality in order to save space. After all, you can read that for yourself by going to Empirical Audio’s website. Instead, I’ve focused on the Overdrive’s sound quality, especially in conjunction with the Empirical Audio Pace-Car reclocker and Monolith battery supply. After listening to a huge range of digital front ends, I can definitively say that the Overdrive/Pace-Car with Monolith is easily among the elite digital front ends available today. Moreover, it achieves this at a much lower cost than most of its competitors. As a further bonus, additional cost savings include the ability to save on expensive aftermarket power cords and digital cables, which could alone add up to $3,000-$5,000. Even further cost-savings can be achieved by elimination of a preamp, and depending upon your setup and how you deal with an alternate form of remote control, this could save you another big hunk of cash. You will have to take care to address the fan issue, by either having the fan biased by Empirical or housing it in a place which blocks out the noise, but you will end up with an absolutely elite front end that stacks up against certain setups costing five times as much. Toss in the fact that you can phase your purchases as your budget allows, and this is a serious contender for the “Audiophile Bargain” mantle. Highly recommended. We at Empirical Audio are pleased and honored to receive this review of the Overdrive Signature DAC from Dagogo. Thanks to Ed Momkus, who wrote a very thorough review. Our strategy with the Overdrive was to eliminate or minimize all of the typical roadblocks to quality sound, including AC power, preamps, jitter and circuit-board dielectric effects. We have experienced over the years the difficulty getting consistently good sound quality with AC power and AC power cords, even though we offer good AC power cords. We have found that a 6-foot DC power cord is much less damaging to the sound quality than the best available 6-foot AC power cord. This is why we adopted the unconventional multiple DC power supply configuration. This also enables our customers to use alternative supplies, linear or battery from Empirical and other after-market vendors. Switching DC power supplies do create some high-frequency noise, but it turns out that this is much more easily filtered than the typical 60Hz noise and rectification switching noise from a linear AC supply. Switching supplies have also improved a lot over time, so more high-end manufacturers are using them. They have the distinct advantage of very high-speed regulation compared to linears. The cooling fan was added initially to the Overdrive in order to extend the component life. Over time we have found that reducing the air flow is acceptable. Some of the bipolar discrete devices actually sound better when hot, like most Class-A bipolar amps. As a result, the new builds have holes punched in the bottom of the chassis and the fan slowed a lot more and redirected, making it audible from about 2-3 feet in a quiet room. We leave our Overdrives powered 24/7 with no problems.The Overdrive chassis was selected in order to minimize the investment and provide flexibility in procurement, as well as reducing cost. The priority was to deliver the best possible sound quality at reasonable cost without regard to aesthetics. However, we are aware that many customers want something artistic and attractive even if it costs significantly more, so we are in the process of developing a custom solid bronze chassis with gold-plated controls that we plan to launch in 2011. The new chassis may eliminate the cooling fan completely. In order to maintain affordability, we plan to continue offering the standard chassis. We are gratified that Ed Momkus was willing to do some apples-to-apples comparisons. It is difficult we believe for audiophiles to make informed decisions when most reviews only describe sonics rather than making comparisons to other products or other formats. We are keenly interested in how close in performance we can come to good vinyl and reel-to-reel systems for instance. We enjoy the Overdrive every day and we hope that our customers get the emotional boost that we do from it, after all it’s about the music.